The Kangaroos won contested possession 143119. Ben Cunnington led all players with 16. Dayne Beams was the Lions best with 12. That was Ben Cunnington's 11th clearance which equals his career best. 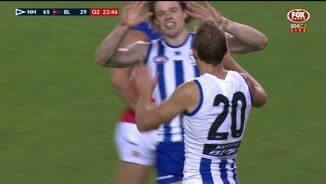 Cunnington also won 11 clearances against the Swans in R4, 2014. That was Jarrad Waite's seventh goal which equals his career best. He also kicked seven goals against Essendon in round 11, 2013. Waite also has a gamehigh 12 score involvements and equal game-high two goal assists. The Kangaroos have kicked four goals from six marks inside 50 this quarter. Shaun Higgins kicks his second goal from his fourth mark inside 50. The Kangaroos lead marks inside 50 185 and have scored 9.7 (61) to 2.2 (14) from these. That was Todd Goldstein's fifth intercept mark. Justin Clarke and Daniel Rich lead all other players with two. The Kangaroos have scored 2.2 (14) from four inside 50s this quarter. The Lions are yet to go inside 50. 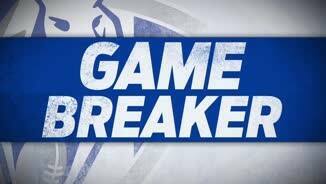 North Melbourne InterchangeSam Gibson replaces Jack Ziebell due to the blood rule. Kangaroos InterchangeJack Ziebell off due to the blood rule. Jack Ziebell leads all players with 398 metres gained at threequarter time. 22 of his 23 disposals have been retained by the Kangaroos. That was Todd Goldstein's third contested mark and the Kanagroos' 14th. The Lions have taken five contested marks. That was the Lions first goal from their last 19 inside 50s. They have scored 1.6 (12) from these. 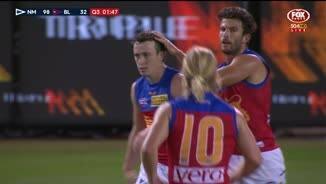 Brisbane Lions InterchangeMatthew Leuenberger replaces Stefan Martin due to the blood rule. Lions InterchangeStefan Martin off due to the blood rule. The Kangaroos lead contested possessions 2918, effective kicks 29-16 and inside 50s 12-7 this quarter. The Lions have now scored six behinds since their last goal, which was in the 13th minute of the second quarter. North Melbourne InterchangeNick Dal Santo off due to an injury. Kangaroos InterchangeNick Dal Santo and is possibly out for the game. Lions InterchangeMichael Close off due to an injury. Welcome to Etihad Stadium for the North Melbourne v Brisbane Lions Round 2 clash. 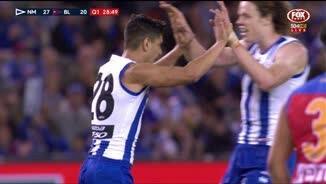 NORTH Melbourne has rebounded emphatically from its humiliating round one loss to Adelaide by overpowering an undermanned Brisbane Lions by 82 points at Etihad Stadium on Sunday. 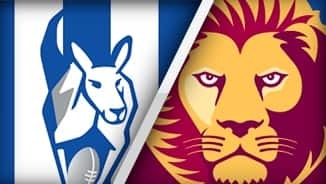 After the Lions kicked three of the game's first four goals, the Roos put their foot down, kicking eight straight goals in less than a quarter and 19 of the next 23 to set up an imposing 20.13 (133) to 7.9 (51) win. Former Blue Jarrad Waite bounced back from his goalless club debut against Adelaide to monster a Lions defence missing injured veteran Daniel Merrett to pile on a game-high seven goals. But Todd Goldstein stood just as tall for the Roos, outclassing Lions duo Matthew Leuenberger and Stefan Martin in the ruck and finishing with 23 possessions, seven marks and one goal. 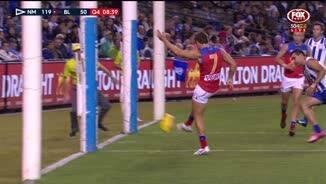 Where North struggled to move the ball with any fluency in its 77-point loss to Adelaide, it played on at every opportunity against the Crows, often with the overlap handball that was the trademark of its 2012 run into the finals. However, the Roos' win could come at a cost with Nick Dal Santo leaving the ground at the 12-minute mark of the third term after appearing to strain his left hamstring. The star midfielder played no further part in the game even though Daniel Wells had been substituted out of the game at half-time. North said on its official Twitter account shortly afterwards that there was "no issue or reason for Wells' substitution" but the midfielder had an ice pack on his heel/Achilles as he watched the game on the interchange bench from the third quarter. It was the Roos' sixth consecutive win over the Lions at Etihad Stadium, with the visitors' last win over North at the venue coming back in round 10, 2009. 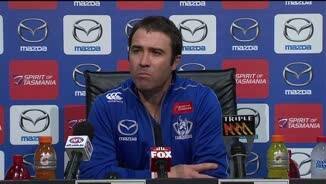 North coach Brad Scott said after the match his team's response to the Crows loss had been "emphatic". "I think the effort in the contest, the things that we were really poor at last week were much better this week," Scott said. "Brisbane started well, I thought they were up for the contest as well and I thought we probably absorbed that early and then responded and adjusted in kind. "But we certainly wanted to be a lot more proactive in all facets of the game – in the contest, when we had ball in hand and defending – than we were last week." Ben Cunnington (11 clearances) and Andrew Swallow (seven) were important for North as it bounced back from its poor contested effort against the Crows to dominate the clearances (42-24) and contested possessions (143-119). Jack Ziebell (27 possessions and two goals), Shaun Higgins (24 and two) and Robbie Nahas (22 and one) were also lively performers, while Sam Gibson curtailed Daniel Rich's influence while racking up a game-high 33 possessions himself. The Lions' loss means it is the third consecutive year they have opened the season with two straight defeats. Coach Justin Leppitsch said it was also the second week in a row that his team had been beaten in contested ball. "When the ball was there to be won, we weren't," he said. "We (were) pretty good at that in the pre-season but that's two in a row where we haven't been. "What we've shown is our game style can hold up. We've done it and we've won (pre-season) games this year with the current group." 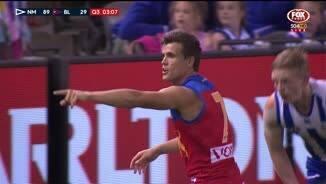 The Lions started brightly enough kicking three of the game's first four goals to lead by 11 points at the 13-minute mark of the first term. 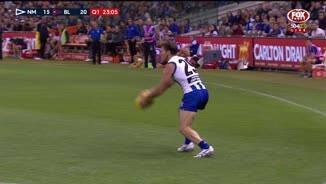 They were able to prey on some haphazard ball movement from North early in the game, with the Roos intent on moving the ball as quickly as possible, more often than not by handball. But once North got its kick-to-handball ratio right – it had 45 kicks to 57 handballs in the first term – it took complete control of the game. Jack Redden (28 possessions), Mitch Robinson (25) Jed Adcock (16 and two goals) were the Lions' best on a tough day. 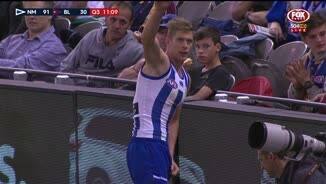 North Melbourne: Mason Wood replaced Daniel Wells at half-time. 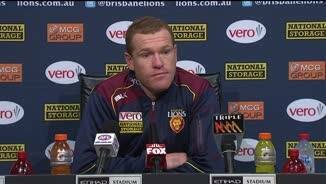 Brisbane Lions: Zac O'Brien replaced Michael Close at quarter-time.